WOW! STELLAR ACTOR UNDERGOES AN AWESOME BODY TRANFORMATION! Rajkummar Rao has proven to be an exceptional actor, with back to back critically acclaimed performances in the past few years. His stellar performances in films like Shahid, Queen, Aligarh and the recent release, Trapped have won him many accolades. The Kai Po Che actor's last release was Behen Hogi Teri, with Shruthi Haasan. Now, the actor is also playing Subhash Chandra Bose, in the upcoming web-series called, Bose, which will be the based on the life of the patriotic nationalist. 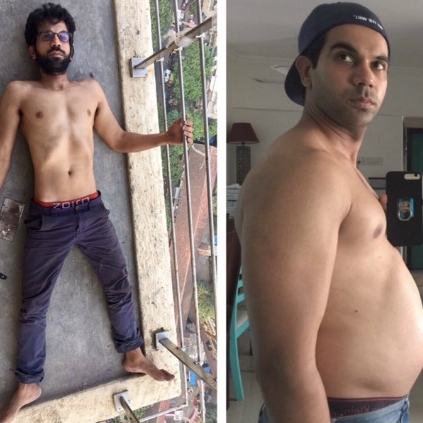 Rajkummar Rao has undergone an impressive transformation by gaining a substantial amount of weight for this character. He took to Twitter to let us know about this transfiguration. ''Building a character. Nothing gives me more high than the process of exploring someone else's life on screen 🙏🏻'', Said the actor, while attaching an image showing his body's changes from Trapped, Behen Hogi Teri to Bose. This is definitely some immense dedication from the incredible performer! Nayanthara to act in this much awaited historical film? Key star injured while shooting a dance number with Vijay! Whatta Gift: SRK wanted Salman to be the first Indian to own this car! Breaking update on theatre strike - Positive signs finally! Celina Jaitly’s father VK Jaitly passed away. People looking for online information on Behen Hogi Teri, Rajkummar Rao, Trapped will find this news story useful.